Picture taken by Tokyo Electric Power Co. on August 26, 2013 and received on September 1, 2013 shows Japan’s Economy, Trade and Industry Minister Toshimitsu Motegi (2R) inspecting water tanks at TEPCO’s Fukushima Dai-ichi nuclear power plant. Tokyo on Tuesday unveiled a half-billion dollar plan to stem radioactive water leaks at Fukushima, creating a wall of ice underneath the stricken plant. 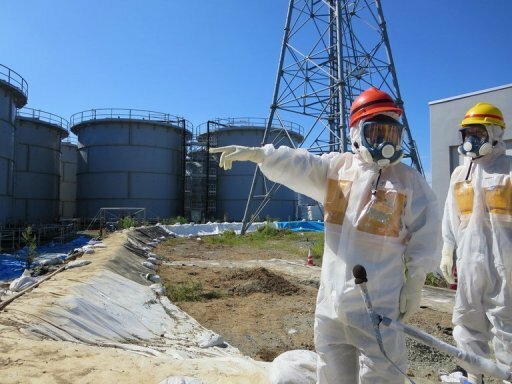 TOKYO (AFP) – (AFP) – Tokyo on Tuesday unveiled a half-billion dollar plan to stem radioactive water leaks at Fukushima, creating a wall of ice underneath the stricken plant, as the government elbowed the operator aside. Acknowledging global concerns over the « haphazard » management of the crisis by Tokyo Electric Power (TEPCO), Prime Minister Shinzo Abe said his administration will step in with public money to get the job done. « The government needs to resolve the problem by standing at the forefront, » he told a meeting of his nuclear disaster response team. « Discarding the current, impromptu response, we will set up our basic policies for a fundamental resolution of the contaminated water problem. « The government will do its best and take the necessary fiscal action, » he said, referring to tapping taxpayer funds. The intervention comes just days before a decision in Argentina by the International Olympic Committee on who should host the 2020 Games. Observers have warned the situation at Fukushima could prove the undoing of Tokyo’s bid. « The world is paying attention to whether we can realise the decommissioning of Fukushima Daiichi, including the contaminated water problem, » Abe said. Thousands of tonnes of radioactive water are being stored in temporary tanks at the site, 220 kilometres (135 miles) north of the Japanese capital, much of it having been used to cool molten reactors wrecked by the tsunami of March 2011. The discovery of leaks from some of these tanks or from pipes feeding them, as well as radiation hotspots on the ground even where no water is evident, has created a growing sense of crisis. Some of the highly toxic water that has escaped may have made its way into the Pacific Ocean, TEPCO has admitted. On top of this, the natural flow of groundwater from the surrounding hillsides, which goes underneath the plant and out to sea, is also causing problems. As it pours through the soil it is mixing with polluted fluid that has seeped into the ground under the reactors. TEPCO says up to 300 tonnes of this mildly radioactive groundwater is making its way into the sea every day. Under the 47 billion yen ($470 million) scheme announced Tuesday, scientists will freeze the soil around the stricken reactors to form an impenetrable wall they hope will direct groundwater away from the plant. This will entail burying pipes vertically and passing refrigerant through them. Officials estimate the whole project will cost around 32 billion yen. The government hopes this ice wall will be operational by March 2015, with a feasibility study already under way, Kyodo reported. A further 15 billion yen will be spent on equipment to remove radiation from water currently being stored. On Monday, the head of Japan’s nuclear watchdog said it was « unavoidable » that water would have to be released into the ocean at some point, although he stressed it would have to be largely decontaminated first. TEPCO’s clean-up at Fukushima has come in for increasing criticism from politicians, academics and Japan’s usually quiescent public. Abe on Monday described TEPCO’s approach to the crisis as « haphazard » and vowed to take the initiative in containing the leak. Last week, one of his ministers compared TEPCO’s handling of the leaks with playing « whack-a-mole », the anarchic fairground game in which players must hit furry creatures with a mallet as they pop up from random holes. The utility — one of the largest in the world — has been effectively nationalised by vast government bailouts needed to stop it from sinking beneath the weight of bills from the clean-up and compensation claims. While the natural disaster that sparked the nuclear emergency at Fukushima claimed more than 18,000 lives, no one is officially recorded as having died as a direct result of the radiation leaks. However, vast tracts of land had to be evacuated, with tens of thousands of people still unable to return to their homes.